It will be unfamiliar but exciting territory for the Hawks Division 1 team when it hits the court in Round 1 of the Victorian Netball League season. The Hawks will enter the season as defending premiers – a tag the club hasn’t experienced since its 19/U team was victorious in 2014. But it’s one the team is both proud and excited to carry into its first clash of the season against City West Falcons this Saturday, March 30 at the State Basketball Centre. Even more exciting are the fresh faces who will don the brown, gold and blue in 2019, all keen to put their own stamp on the team’s 2019 premiership aspirations. TICKETS HERE: WATCH THE HAWKS PLAY THIS SATURDAY NIGHT! Former 19/U defender Sally Deller returns to the club after having a season off, goaler Elle Rice has made the move from Geelong Cougars, while Northern Territory product Bronte Pearson will bolster the midcourt after a couple of injury-interrupted years, alongside former Hawks (Monash) player Gabby Henderson, who is also rejoining the club. In addition, midcourter Jasmine Ferguson will be a full-time fixture in Division 1, after being elevated from 19/U late in the 2018 and playing a starring role throughout the finals series, while veteran defender Beth Chiuchiarelli will provide valuable experience as she returns from a knee injury. Goalers Daisy Hill and Monique Lenehan-Moustafa, midcourter Enya Broadley and defender Chloe Sinclair all return from the 2018 side. But Round 1 assignments don’t get any more challenging than Falcons. Renowned as perennial Division 1 finalists, Falcons missed the post-season in 2018 but split the points in their two encounters with Hawks, including a 42-35 Falcons win in Round 16. Hawks Division 1 coach AJ Ballantyne says the Hawks are looking forward to testing themselves against one of the league’s powerhouses first up. “Obviously it takes time to build combinations and develop that chemistry as a new unit, but we’ve been really pleased with the way the girls have approached pre-season,” Ballantyne says. 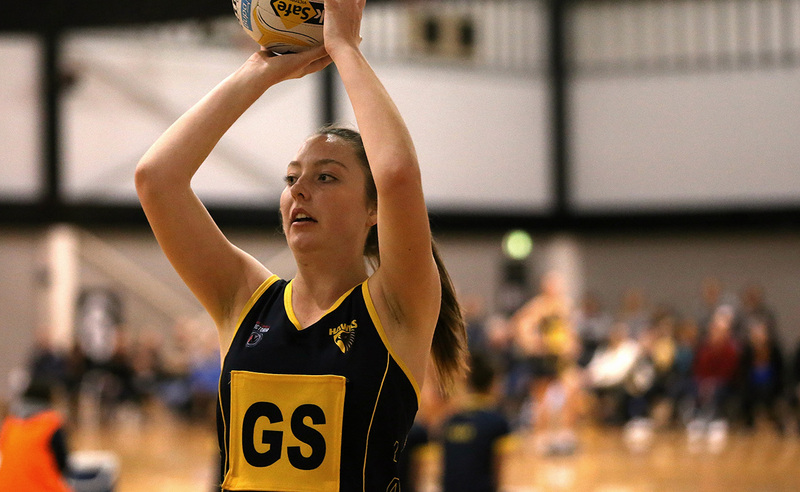 Hawks Netball plays City West Falcons in an opening-round Victorian Netball League home game on Saturday night at the State Basketball Centre in Wantirna South. The action starts with 19/U at 6.20pm, Championship division at 7.40pm and Division 1 at 9pm. TICKETS ARE LIMITED. BOOK YOURS HERE! No Replies to "NEW-LOOK HAWKS READY FOR DIVISION 1 CHALLENGE"